On Monday, 3 January 2011 a solemn Mass was held in the fabulous St. Wenceslas Chapel of the Cathedral of St Vitus in Prague to mark the feast of St. Basil the Great, Patron Saint of the Order of St. Lazarus. St Basil, who died on January 1, 379AD, was not only an excellent writer, preacher and theologian, but in the 4th century founded an exemplary hospital, the Basilias, for lepers, whom he cared for, “not even neglecting to kiss them in defiance of contagion”, we are told. In this he was an example to the Order of St Lazarus, which continued his saintly efforts. 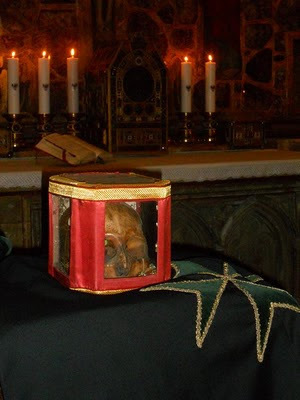 A wonderful relic, the skull of the saint, was brought from St. Vitus treasury, where it is reserved. 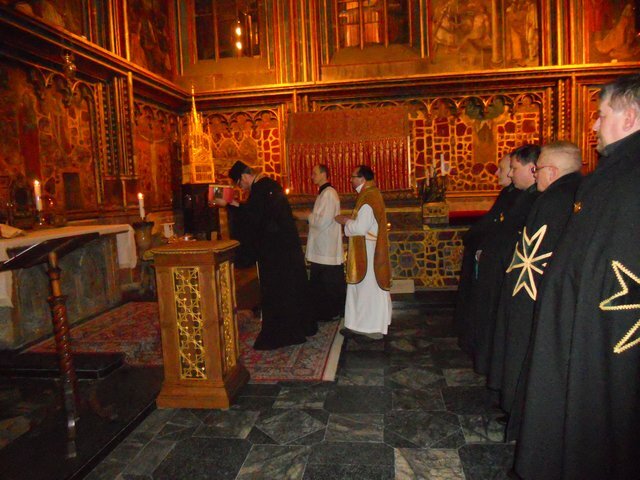 The Bailiff, the Chancellor and members of the Prague Commandery assisted at Mass which was offered by Fr. Pavel Porochnavec, SChLJ, assisted by Fr. Jan F. Beránek, ChLJ. This beautifully decorated Chapel, the masterpiece of Czech Gothic, is dedicated to the patron of Czech lands, St Wenceslas, a Bohemian Prince from the Premyslid dynasty assassinated by his own brother. 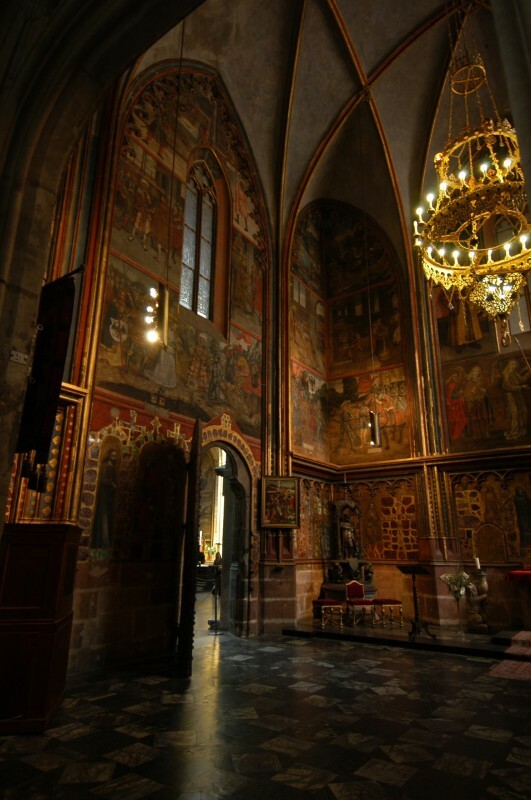 The chapel was built on the site of the Romanesque rotunda where Wenceslas was buried and still houses the holy relics of the saint. The Chapel is not open to the public, but visitors can look in through the door. 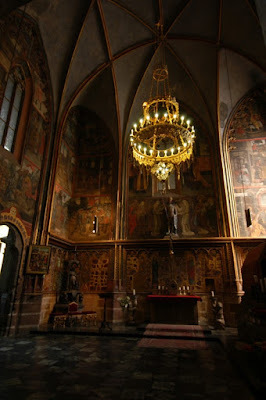 Every Czech coronation started in this Chapel, as the kings went to pray there. It is said that whenever the Czech nation was in danger or suffering hard times special night Masses were offered in this Chapel. Mass is still offered here but usually only on the Feast of St Wenceslas (28th September), so this Mass was a wonderful occasion for our noble Order since our new Grand Master, Count Dobrzenský z Dobrzenicz, is not just Czech, but a descendant of St Wenceslas himself. May this Holy Mass usher in not just a New Year, but a new era in the long history of the Order of St Lazarus. St Wenceslas, Pray for us. 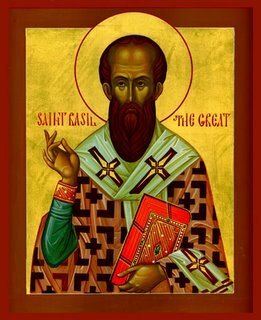 St Basil the Great, Pray for us. St Lazarus, Pray for us.